Two weeks later, works have commenced as promised with the Virgin Islands Party (VIP) Government making good on its mandate to not leave any district behind and to be a government of inclusion. With Hon Julian Fraser RA on the scene, the infamous road in District Three (D3) was given priority after some 8 years [2011-2019] of neglect from the Dr D. Orlando Smith led National Democratic Party (NDP) Government. Further, many residents and former Opposition Members including Hon Fraser, the D3 representative as well as former Leader of the Opposition, Hon Andrew A. Fahie of District One (D1), have long accused the NDP of discriminating against representatives who were not in Government. Following the Hurricanes of 2017, critics have claimed that the then NDP government completely ignored the West End Port restoration only because it is located in D1. During that time, political pundits also attributed the neglect of water and road infrastructure in D3 to NDP’s spitefulness against the Opposition. 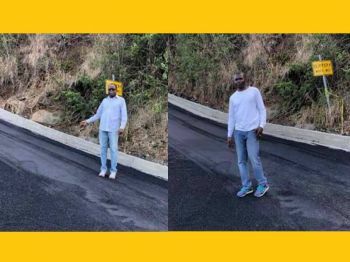 However, under the new VIP elected administration, works are almost completed with proper drainage and asphalt on ‘Elevator Hill’, a road that has been the scene of many vehicular accidents over the years. Yesterday, Saturday, April 6, 2019, subject Minister for Transportation, Works and Utilities Hon Rymer and Representative for D3, Hon Fraser visited the area to inspect the works. Meanwhile, many residents on social media have expressed pleasure to see the new respect the VIP is giving to district representatives, regardless of their political affiliation. In an April 2, 2019, interview at the Virgin Islands (VI) House of Assembly (HoA), Hon Fahie had said he resented the way NDP treated the opposition district representatives and the VIP government will take a completely different approach. Now, many have said the new Premier appears to be off to a great start in his promise to bring new ‘change and renewal’ to the territory. Do you want the VIP government to start victimization? Is this not the government of inclusion? I said it during the campaign trail it doesn’t matter which government is elected this man provides a service that the territory needs. While you pointing your finger about who he supported, he’s conducting business. We have a small minded mentality in the BVI that will keep some of us always struggling because before we’re concerned about creating a sustainable business of our own to service our country we want to stop somebody else’s. I don’t have an opinion of him either way but it seems to be that his business will be around for some time. Please stop breathing hate and let our government continue to work. The same Whitehead has to live too and where else he going go. I’m sure our government isn’t thinking like you are so stop it. Maintenance and repair on the Elevator Hill” has been neglected for years, resulting in severe deteriorated condition. Though the Nedra surfacing and drainage work is welcomed, the MCW, for MCW J. Fraser, the motoring public.....etc knows that this work is only a temporary fix. This fix will have a short life span. No need to believe the Road Dog; get a second opinion from any seasoned civil engineer. Dr. D. Glasgow I believed majored in transportation so he is an expert roads. What do you say Dr.? Anyway as other bloggers have noted, the real and permanent fix for a failed road is a complete reconstruction, excavating the failed road down to subgrade and replacing it. The “Elevator Hill” moniker indicates a steep/ high sloped road. The steep slope road is hell on a transmission and brakes, posing an operational risk and contributing to accidents and injuries that can be fatal. The fix is a complete redesign of the road, ie, reducing the slope. Can you guys PLEASE input some HEIGHT CLEARANCE BARS at both entrances to this hill to ensure the concrete and other trucks that are causing damages to this road be forced to utilize other roads? I believe it is time we get serious about our tax money. And if we leave it to the discretion of the drivers, they will NOT adhere to it and we will be back in the same position. Please let us consider this technology and advancement for other areas that can be problematic. Without any pavement condition index (PCI) data, I will take a guess that the road was in a severely deteriorated condition, requiring complete reconstruction. If the assumption is correct and there is major base failure, the maintenance/repair pavement resurfacing effort, though an improvement, is only a band aid, a temporary fix. Until a comprehensive reconstruction is performed, funding and placing a pavement overlay will be a frequent and ongoing action to keep road in a serviceable condition. From my vantage point, the slope on too many roads are too steep. These steep slopes are hazardous, place expensive strain on transmission, brakes.....etc and may contribute to accidents. Reducing the slopes on steep roads is a long-term process. However, in the short to medium term, action should be taken to improve horizontal and vertical curves, institute an aggressive low cost preventative maintenance ( retard deterioration, extend road life, reduce operational cost, improve serviceability, reduce vehicle owners operating expense) programme, institute an aggressive pothole repair programme, improve drainage, spec road projects to safely carry the heaviest wheel load that will use them, ensure roads are constructed as designed, employ strict inspection of road work being put in place and minimize road cuts. Designing and constructing roads on flat terrain is not as challenging as on hilly terrain. Typically, on hilly terrain, to reduce the steep slopes, roads are designed and constructed in a long and winding manner, ie, they are cut in a circular pattern instead of going straight up. One benefit of the long winding pattern is that it provides better access to land. True, there may be challenges to acquiring right-of-way to construct road network in a long winding manner. Nevertheless, it should be done to the maximum extent practical.